Instead, the agency is organizing an event to help the American Civil Liberties Union and the International Rescue Committee. It also has plans to donate $250,000 to the two groups. United Talent Agency, known as UTA, announced the move on Wednesday. The company says it represents actors and writers in the movie industry, as well as in television, books, music and digital media. Iranian filmmaker Asghar Farhadi is one of the agency’s clients. He was nominated for the Best Foreign Language Film Oscar for his movie The Salesman. 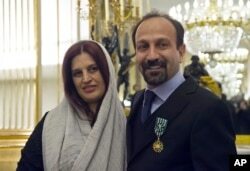 Farhadi announced early this month he will not attend the Academy Awards ceremony on February 26. Iran is one of seven countries listed in an executive order signed by U.S. President Donald Trump. The order bars Iranian citizens from entering the United States for 90 days. Iranian actress Taraneh Alidoosti, who stars in The Salesman, has also said she will not attend the ceremony in protest of the executive order. Trump has defended the measure. He says it is necessary to protect American citizens and to prevent possible terrorists from entering the country. Last week, a judge in Seattle temporarily suspended the ban on travelers from the seven countries. A federal appeals court on Thursday refused to block the lower court ruling. President Trump plans to appeal the ruling, taking the case to the U.S. Supreme Court. UTA said the event is designed to help the American Civil Liberties Union and the International Rescue Committee, known as IRC, which work in support of civil rights and help refugees. The IRC thanked the Hollywood talent agency for its support in a Twitter message. Another talent agency, WME-IMG, has announced plans to form a Political Action Committee. The agency said the committee will raise money to support or oppose political candidates, ballot measures or legislation. Chris Hannas reported this story for VOANews.com. Marsha James adapted it for Learning English. George Grow was the editor.